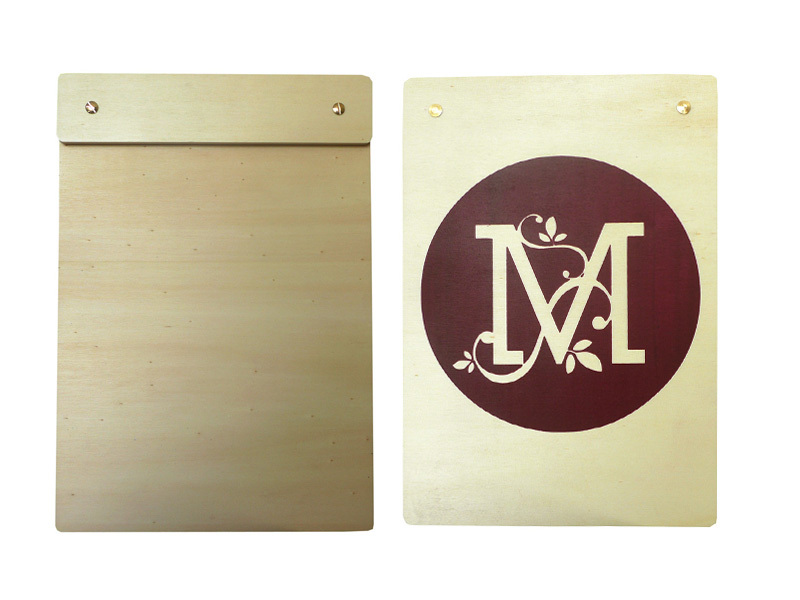 Not all menu boards are equal our menu board timber is fully customizable from colour of the french polish to how you choose to apply your logo. You can emboss, screen print or foil stamp. If you decide to screen print then we can make your logo fit the whole back side of the board for maximum brand exposure! As a rule menu board timber is perfect for smaller menus or drinks lists but not limited to that as we have customers that use them for larger menus and drinks lists. We use inter screws to bind the menu board timber together so you can fit any number of pages or PVC pockets (ask us about our synthetic paper stocks) to ensure a bullet proof solution. The menu board timber will wear extremely well and can be used both inside and outside meaning you will never need to worry about the elements again making our menu boards perfect for all indoor outdoor restaurants, bars, cafes. We can send you a sample of the cover you are looking for - This will be an extra from another job. We will also send fabric samples if the colour you require is not available. SKU: WMB sample. Category: Samples. Tag: productSample.